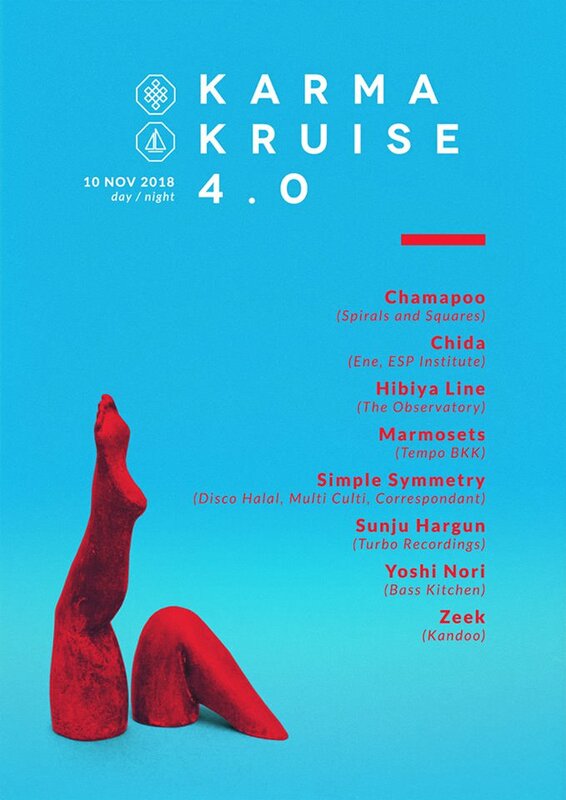 After hosting three sold out Karma Kruise events, Karma Klique is about to embark on their largest boat party on November 10. The fourth edition of Karma Kruise will take place on a the three-tiered White Orchid boat that will be able to host 500 party punters. Originally a luxury dining vessel, the boat will be converted into the biggest floating dance floor Bangkok has ever seen. The organisers have carefully curated an eclectic selection of acts for this special occasion. Russian duo Simple Symmetry who are known for their hypnotic grooves through their releases on Disco Halal and Multi Culti will be headlining Karma Kruise 4.0. They will be joined by Taipei’s crowd favourite Yoshi Nori and one of Bangkok’s most celebrated tastemaker Sunju Hargun. And it doesn’t end there. The event will continue with an afterparty at Safe Room that boasts an equally impressive lineup which includes one of Tokyo’s pioneering DJ Chida and The Observatory’s founder Hibiya Line. They will be supported by some of Bangkok’s finest like Zeek, Marmosets and Chamapoo. You can check out all the details for Karma Kruise 4.0 here. Watch the video from Karma Klique’s previous cruise below.